Several of my fellow artists dislike custom/commissioned work – I absolutely love it! It’s a chance to break away for the norm, and a challenge at the same time. The challenge being, to take someone else’s idea – one whom I never actually get to talk to in person – and turn it into a piece of jewelry that matches as close as possible to what they had in mind. 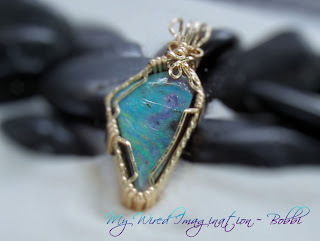 I recently had such an opportunity….. A very wonderful lady, Barbara, purchased my favorite opal from my Etsy shop and requested I turn it into a pendant as a birthday present for her daughter. 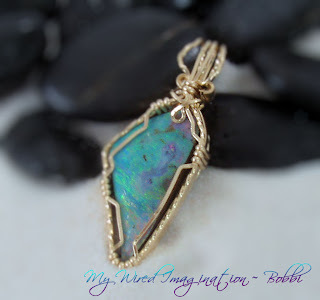 Her requests were simple – pendant in 14k GF wire – special birthday present – no pressure, no pressure. Her request left a lot open for interpretation, and while I was excited to do the work, I was a little sad to see such a beautiful stone go…(I was still trying to justify adding it to the ‘Me Collection’). e is the second attempt, and while several people saw the first attempt and saw nothing wrong, I am much happier with the outcome of the second attempt. I could not in good conscience send it, if I wasn’t willing to wear it myself. Barbara emailed me several days later, after she received it, and was totally thrilled with it – which made all the stress over getting it ‘just right’, more than worth it. Barbara said, “the hardest thing now is to hide it from my daughter, until her birthday in October”. – Good luck ‘Mom’ :D.
Thank you for visiting – stop back again soon….. I love this one. It's awesome!